On April 16, 1945, the destroyer USS Laffey (DD-724) got crashed by seven kamikaze planes  and hit by bombs dropped by two other Japanese aircraft. Laffey managed to stay afloat despite fires, inoperable guns, and a jammed rudder, but 32 men died and 71 men were wounded  in the attacks in which Laffey fought for 80 minutes against 22 Japanese kamikaze planes and conventional bombers . The ship was hit more times by kamikaze aircraft in a single day than any other ship. The heroic story of her survival due to the efforts of Captain F. Julian Becton and the crew has remained famous until today due to books, articles, documentaries, and the ship herself docked at Patriots Point (Mt. Pleasant, South Carolina). 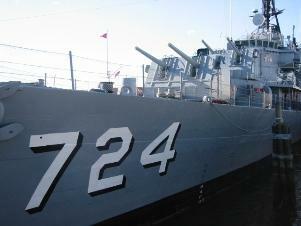 Since 1982 , Laffey has served as a museum ship where visitors can view the famed destroyer. The Patriots Point Naval and Maritime Museum across from Charleston in Mt. Pleasant has several ships that can be toured including the huge aircraft carrier Yorktown (CV-10), Laffey (DD-724), the Coast Guard cutter Ingham (WPG-35), and the submarine Clamagore (SS-343). Yorktown never got hit by a kamikaze plane, but the Carrier Aviation Memorial (located on hangar deck) that honors aircraft carrier casualties has photographs of carriers hit by kamikazes including Essex (CV-9), Intrepid (CV-11), and Lexington (CV-16). Some individual WWII aircraft carriers have established museum rooms in Yorktown that have exhibits of various items including photographs of kamikaze crashes and pieces of kamikaze aircraft that hit the ships. These carriers include Saratoga (CV-3), Enterprise (CV-6), Essex (CV-9), Franklin (CV-13), Ticonderoga (CV-14), and Hancock (CV-19) . Yorktown has numerous other special exhibits and memorials that make it one of the most comprehensive WWII naval museums anywhere. The Laffey tour route allows visitors to walk the deck and go inside the ship in order to view the bridge, guns, battle stations, living quarters, and the WWII Destroyer Exhibit in Laffey's former berthing compartments. The destroyer's length is 376.5 feet, and her wartime complement was 336 men. 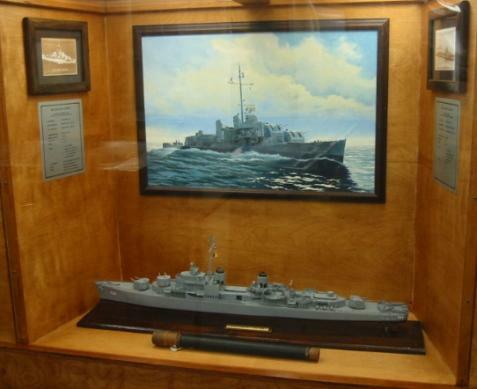 The mess hall has many exhibits about both the original USS Laffey (DD-459), sunk in a sea battle off Guadalcanal in November 1942, and the second destroyer named Laffey (DD-724). 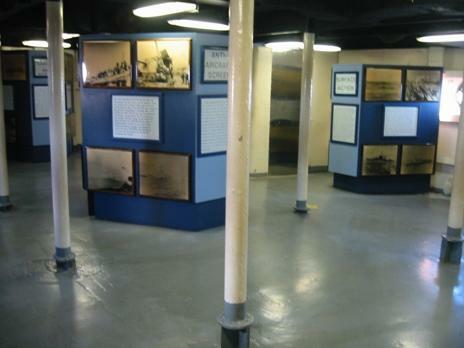 The walls have various paintings, display cases, and plaques related to the two ships named Laffey. 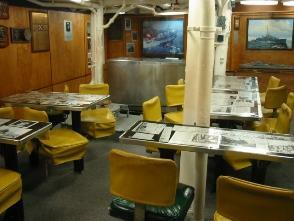 The tables and chairs are still in the mess hall, and the tabletops contain many newspaper articles and exhibits related to the two destroyers. One tabletop has the complete five-page comic story entitled "Name to Remember" from the Winter 1945 issue of True Comics. This story gives the battle history of both destroyers named Laffey. After Laffey had been seriously damaged by the kamikaze attack on April 16, 1945, the ship made it back under her own power to the States for repair. Several newspaper articles displayed on tabletops in the mess room show photos of Laffey's exhibition to the public at Pier 48 in Seattle from May 26 to 30, 1945, from 1 to 9 p.m. each day. Over 65 thousand persons visited Laffey to see the damage inflicted on the destroyer by the kamikaze attacks. Signs around the ship indicated the location of hits or casualties, such as: "Jap bomb hit here killing 3 enlisted men." The twisted steel 5-inch gun turret gets prominently displayed. The tabletop displays also contain congratulatory messages that Laffey received from ships and others after her survival. Commander Frederick J. Benton, of Hot Springs Arkansas, inspects damage done by exploding ammunition about the USS Laffey when the destroyer was attacked by seven Jap Kamikaze suicide planes in battle off Okinawa April 16, 1945. TOP: On 15 April 1945 LAFFEY DD-724 (this ship) took three bombs, two near misses and five kamikaze planes, but survived and eventually fought again off Korea. The primary reason for the varying numbers of kamikaze aircraft that hit Laffey seems to be that some hits were just glancing blows that did not cause any significant damage or casualties. Some sources appear to count these, and others do not. The WWII Destroyer Exhibit in Laffey's former berthing compartments displays various photos and describes the important roles of destroyers in WWII. There are photographs and information related to kamikaze attacks on other destroyers such Hugh W. Hadley (DD-774), Evans (DD-552), and Kidd (DD-661). An admission ticket for all ships at Patriots Point costs $22 for an adult. Patriots Point has a Ship Store that sells various souvenirs and books, including ones about Laffey's history such as The Ship That Would Not Die (1980) by F. Julian Becton with Joseph Morschauser III and Hell from the Heavens: The Epic Story of the USS Laffey and World War II's Greatest Kamikaze Attack (2015) by John Wukovits.